MOUNT HOREB – Jack Lavern Zahler, age 68, of Mount Horeb, passed away on Tuesday, Sept. 11, 2018, at Agrace HospiceCare in Janesville. He was born on May 14, 1950, the son of Kenneth and Viola (Gilbertson) Zahler. Jack was baptized and confirmed in the Zwingli United Church of Christ in Mount Vernon. He graduated from Mount Horeb High School in 1968. Jack was employed and drove truck for Cleary Building Corporation in Verona for 30 years and retired in 2013. Jack’s passion to hunt and fish were first and foremost in his life, and doing it with his best friends made it worth every minute (and story). The deer mounts he proudly displayed throughout his home all have a story, and if they could talk, we’d probably get the ‘real’ story. Jack shot his final buck in the cornfield next to his home, deer hunting season 2017. 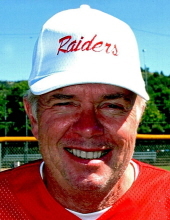 Jack truly was passionate for fastpitch softball and “For the Love of the Game.” He earned the name “The Legend” and could knock one out of ballpark at any given time, but the Mount Vernon Park was his favorite. Over the years, he played for several teams, traveled to several states and had a uniform for almost every day of the week. The friendships made during these years and across the miles were many. A Packers and Brewers fan at heart, Jack seldom missed watching a game and he always called one of his friends to make sure they saw the same ‘bad play’ or heard the same ‘bad call’ that he did. Jack is survived by his sister, Nancy Kay Riemenapp (George Johnson); brother, Terry L. (Denise) Zahler; and many nieces, nephews, extended family and friends. He was preceded in death by his parents; and brother, James K. Zahler. A Celebration of Life will be held at MOUNT VERNON FOREST OF FAME PARK from 11 a.m until 4 p.m. on Sunday, Sept. 16, 2018. Per Jack’s wishes, no visitation or funeral will be held. Please feel free to wear casual/Packers attire in Jack’s honor. Memorials may be made to family for designation at a later date. Online condolences may be made at www.gundersonfh.com. "Email Address" would like to share the life celebration of Jack Lavern Zahler. Click on the "link" to go to share a favorite memory or leave a condolence message for the family.